lazy weekends call for lazy art, right? It’s the weekend, time for a few errands, grocery shopping, mending a bit of that landscape edging you promised your wife you’d get to a month ago, and spending some time with the kids. Truth be told, our weekends are usually all sorts of busy here in the Rimes’ household, and I’m sure any other family with younger children will agree, it’s far too easy to find yourself working harder on a Saturday than you might have during the week. We’d like to think of Saturday and Sunday as “lazy” days in which we can relax with our family and friends, and just enjoy the brief time we have before heading “back to the edu-coal mines” on Monday. Reality though, typically means that we plan more activities and structure instead of playtime on those two precious days (at least it feels that way in our house many weekends). So I thought I’d kill two birds with one stone by capturing a silly moment, and completing a ds106 assignment (yes, even ds106 can feel like one of those weekend chores if you’re trying to “play good” and complete the right number of assignments). But that’s beside the point! How in the world is this applicable to the classroom? Quite often I see teachers in my district using Photobooth for one of two projects; either photos of everyone at the beginning of the year to go up on walls or special bulletin boards, or “special effects” photos for big projects. It’s a shame that they don’t have access to the Macbooks more often (each elementary only has 2 MacBook carts, the MS and HS 3 carts apiece), because Photobooth would make an excellent visual journaling tool for capturing daily learning experiences, moods, and just the general well-being of learning going on in a classroom. Photobooth does stills and video, so you could switch it up from day to day, maybe even taking subsequent shots to stitch together as an animated gif, or create a series of video reflections from a bunch of students after a rather large project. Today, I just used it to capture the kids and me being silly around the breakfast table. The “Warhol Effect” was appropriate, and rather than print it out, post it on a nice bulletin board to make the hallways or classroom walls “more presentable” like I see at school, I’m just going to post it here in a quick “this is what’s going through my head right now” manner. No doubt the kids and I will stumble across it in a few years time (I’ve dumped it into my iPhoto album as well) and have a nice memory of this morning. If it wasn’t raining I’d be out doing those chores today. Instead I’m cranking on a few DS106 projects today too. My granddaughters introduced me to PhotoBooth this weekend and we had riot! It’s fascinating fun. Good for you and your children! 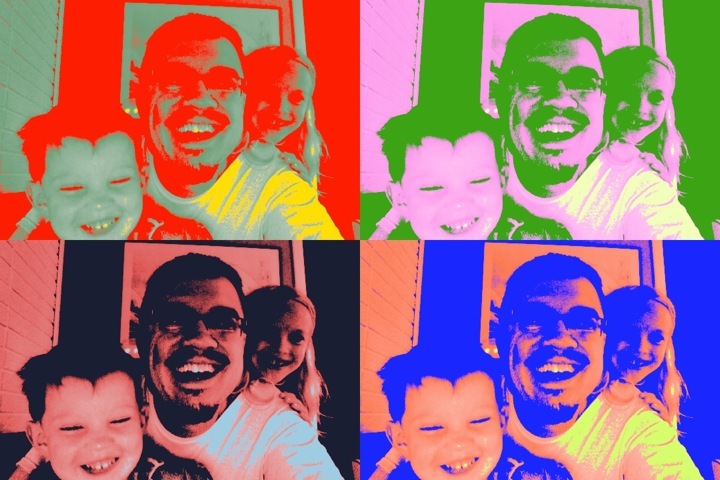 I’ve saved some of the photos and movies my kids have recorded on Photo booth – will make entertaining watching when they get older! Maybe embarrass them at their 21sts!